Another day, another iconic stadium and rivalry. I first went to Yankee Stadium on my way to college in 1965 and saw the legends, Mantle and Maris (among others) along with the classic filigree along the roofline. Today it is a “new” stadium but with all the history and tradition of the franchise. Unfortunately, (from my perspective at least), that also includes the somewhat gaseous “Monument Park” in center field. 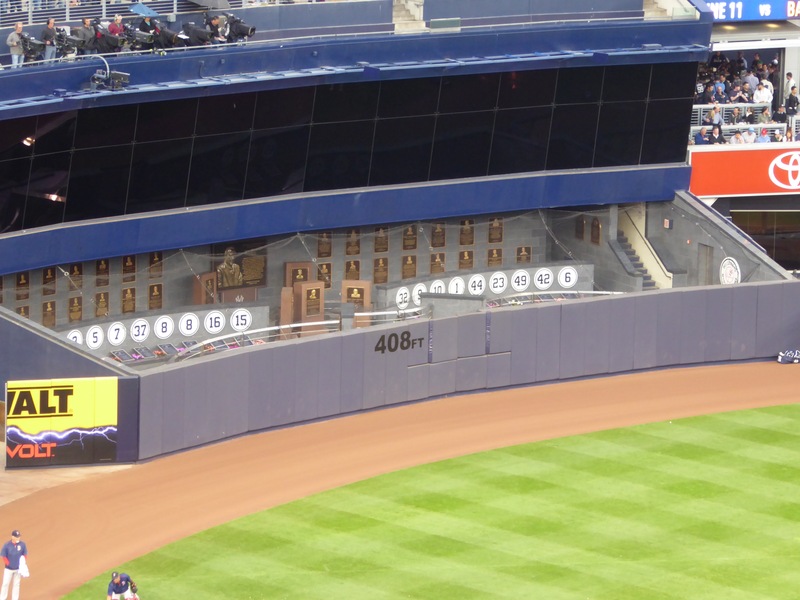 Yes, the Yankees have had a lot of great players, but here they are memorialized with brass plaques larger than those afforded the Hall of Fame inductees in Cooperstown. 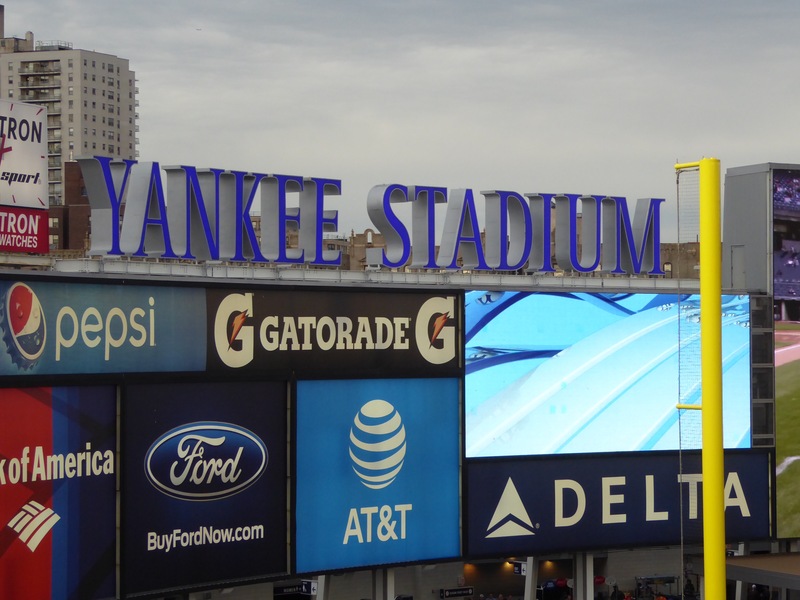 And you won’t be surprised to learn that the largest of them all commemorates that largest of personalities, George Steinbrenner. Ho hum. On this occasion, a former Mariner, Michael Pineda, performed well. He kept the Red Sox off balance and mostly off the bases. Meanwhile, the Yankee bats roughed up David Price in just his third start since injury sidelined him in spring training. He gave up two homers (five RBI) to Gary Sanchez and three hits to Aaron Judge. 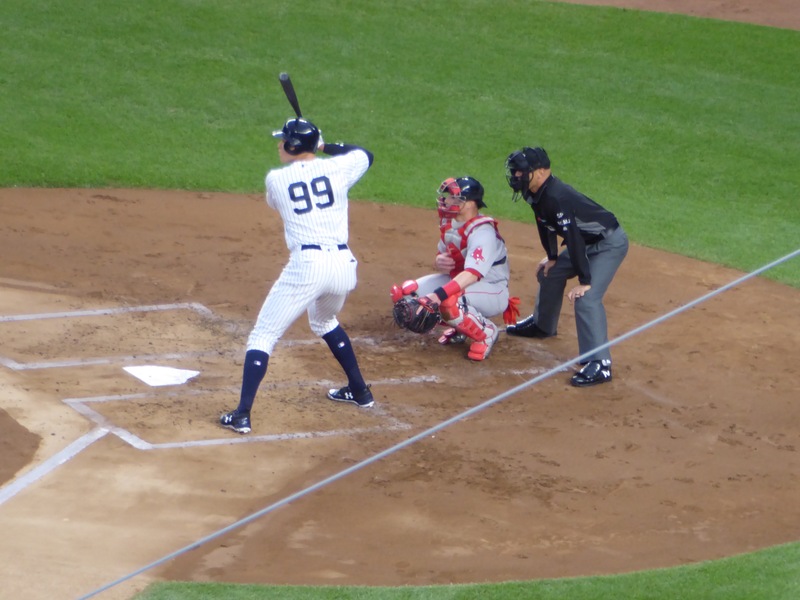 Speaking of Judge, you can see he wears number 99 on his jersey, one of very few in the history of major league baseball to do so. Why? It seems he was called up late in the season last year and for no particular reason, just stuck with his spring training number. 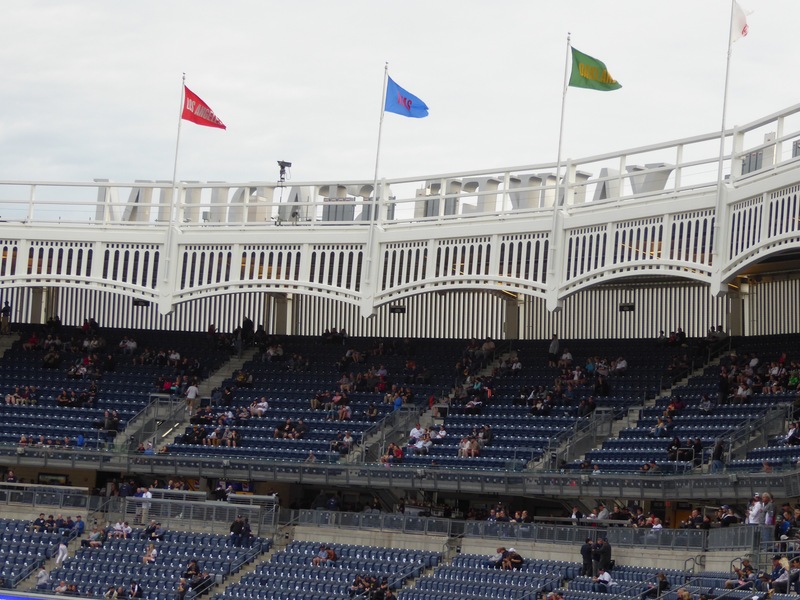 There were flashes of the “Judge’s Chamber” on the Jumbotron, but I never did locate it in the stadium. Truth be told, I’m not even sure what it is beyond the picture of a guy with a wig and gavel in a courtroom-like room. This being New York, it seemed imperative that I indulge in a kosher hot dog. But that presented a dilemma – Nathan’s or Hebrew National. With nothing to go on but instinct, I chose Hebrew National and was not disappointed. Footlong with plenty of kraut and mustard and I was a happy camper. Especially for just $7.50. On the other end of the scale, beer was $12.50 (I concluded the old saying might apply – especially on a cool, cloudy night – absence [actually abstinence] makes the heart grow fonder). I’ll await a hot evening for that beer at a better price. And now for the rant. It looked to me like less than a third of the fans were in their seats for the first pitch. And at least half were gone by the seventh inning. The young folks in front of me consumed a lot of beer and saw at best three or four plays the entire game. Chattering, taking selfies and otherwise depleting their phone batteries seemed to be their reasons for attending. Why bother? Go somewhere else that has cheaper beer and leave the baseball to us geeks.